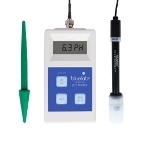 If you live in a Hard Water area, you are likely to need pH Down. pH DOWN contains orthophosphoric acid (H3PO4). The concentration is 81%, which is very strong so handle with care. This product cannot be sent through the post, only via courier.